‘You’ve never heard The Wild Tchoupitoulas?’ he’d cry. ‘Man that was the Neville Brothers at their best. It just wouldn’t be N’awlins without them!’ The room would swell with that Cajun rhythm, and before long we’d be dancing around the room. It was that good. He also turned me on to Creole food. Jambalaya, gumbo, ‘Po’boy’ sandwiches and crawfish that were spiced to his demanding palate. And Red Beans and Rice, cooked long and slow to develop the flavor. Made with that trinity of Creole cooking: celery, green pepper and onion. Mm, Mmmm. Of course, Chuck’s Red Beans would always have ham hocks in them; I’ve chosen to leave them out. Either way, these tasty beans are just what the doctor ordered. In fact, it wouldn’t be Mardi Gras without them! Soak the beans: In a large pot, cover beans with enough cold water to submerge them by 2″. Cover the pot tightly and let the beans soak for 8 hours or overnight. Make the trinity: Remove outer skin, trim ends and chop the onion. Rinse and chop the celery with its leaves. 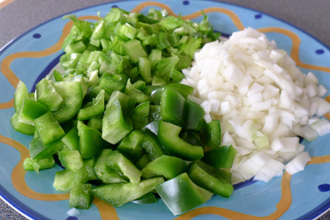 Remove seeds and stem and chop the green pepper. Heat 4 Tablespoons of oil in a 12” skillet. Sauté the onion, celery and green pepper over medium-high heat for 5 minutes, turning occasionally with a spatula. Veggies are done when the pepper lightens in color and the onion is translucent. For best flavor, do not brown. Put it all together in a pot: Drain the beans. In a large oven-proof casserole or dutch oven, put the beans and 6 cups of cold water and stir in the sautéed veggies. Now add the salt, black pepper, oregano, thyme, cayenne pepper and garlic. Bake in a conventional oven: Preheat oven to 325°. Put beans on the center rack and bake for 2 ½ hours covered, stirring every half hour or so. After 2 ½ hours, add the tomato sauce and remove the lid from the bean pot. Cook for a further hour, until beans are tender. 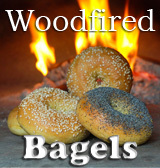 Bake in a woodfired oven: This kind of cooking is great for the day after you’ve had your oven hot for pizza or bread, still warm with residual heat. 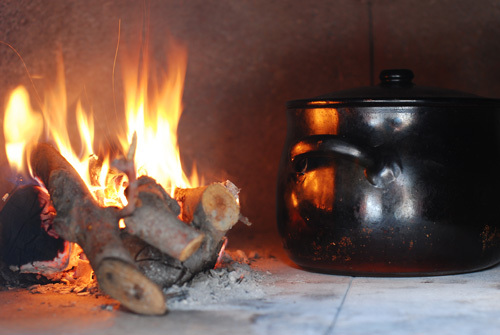 Build a small fire to one side and, after about 45 minutes, put the beans on the other side. Add small to medium branches to keep the fire low and put the door in place to keep the flame down, leaving a 2” crack on one edge of the door as a vent. At this low heat, you can use an oven thermometer to check that your oven heat is as close to 325° as possible. Bake for 2 ½ hours covered, stirring every half hour or so and turning the bean pot around each time. After 2 ½ hours, add the tomato sauce and remove the lid. Cook for a further hour, until beans are tender. Time to celebrate: Make a pile of rice according to package directions. Put a scoop or two of rice in a bowl and top with Red Beans. Now get out your favorite Neville Brothers music and prepare to PARTY! It’s Mardi Gras after all! Meatatarian note: For a meaty version of this dish, add 2 pounds of smoked ham hock to the pot and cut back on the olive oil. On the other hand, this vegetarian version makes a great side dish to Seattle Smoked Country Style Ribs, which I’ll be cookin’ up for Mardi Gras as well. It’s all good! I am ready to celebrate Don!!! I’ve never had red beans and rice before, this looks fabulous! I am going to save this so I can give it a try!! You were lucky with roommates. These perfecty spiced beans do invoke New Orleans and this is the week for it. Love the idea of celebrating with beans and rice. Red Beans and Rice has always been a favorite. 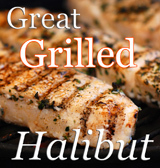 Your recipe is nicely spiced and flavorful. I’m sure the ham-hocks won’t be missed. HA! I knew you were talking about Chuck. I can just envision him. What great memories. 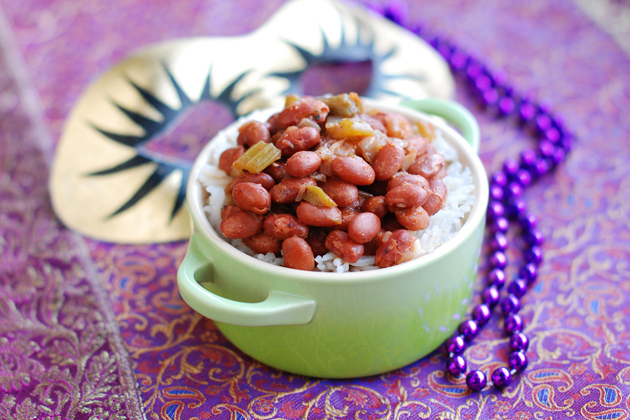 I’m going to try the beans, because unlike you, I have been to N’awlins – and love red beans and rice! NOLA had the best food of any city I ever visited in the US. I love the picture of the bean pot (looks Italian, by the way…!) cooking by the fire. Now that’s what I call bean cookery! Mmmm this looks delicious! I made a jambalaya last night for my Fat Tuesday blog post. It was delicious and still under a “cooking light” category which was great! Still had all the flavor and heat with shrimp and andouille sausate! My guess is I could have red beans and rice in that way too! Congrats on your top 9! You should visit NOLA. Good eats there! Given the choice I’d choose your beans over our cake for a Mardi Gras celebration. Better yet, lets put them together and have it all together??!! My husband loves red beans and rice. I’ve been making the same recipe for year, but I’m sort of ready for a change. This is printed and in my “to try” file. He will be a happy guy. Your comment about your MIL’s pancakes had me laughing out loud! Looks like a great pot of red beans! Hey guy! When you guys are ready to share Kim’s King cake and your beans and rice, I’ll bring my beignets and French roast! Those beans look awesome! Sounds like a party to me…. Happy Mardi Gras to all of you! And as my friend Chuck says: Laissez les bon temps rouler! Oh, the Neville brothers! Gotta love em! And gotta love these beans and rice! YUM! Those beans looks delicious! Lovely photos. I used your recipe as a guide for a version of my own last night. So good! Red beans and rice, now this is something I could never get tired of. Great recipe, thanks for sharing. Ever made this with a crock pot? I would love to be able to make it before work and have the beans ready when I get home! Thanks! My experience is that the kidney beans will not soften if you add the salt at the beginning of cooking them. Traditionally, beans were cooked for at least an hour before adding salt. Soaking overnight makes the beans more digestible, but you still need to wait before adding salt. I’m guessing this recipe was tested with canned kidney beans; and that most people are making it with canned beans.